Does your professional IG need a facelift? Most people think they know how to use Instagram for business but your IG is as good as dead if you’re struggling to engage and convert customers. See how four creative businesses are using Instagram effectively and learn how to supercharge your own IG account! Using Instagram for business requires a different approach. You won’t get anywhere if you just post selfies and haphazardly manage your account. There are major opportunities for every business and every type of brand on IG, but you need to know how to use this platform the right way. 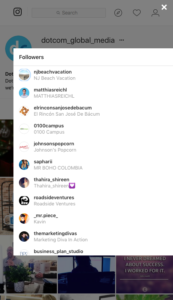 With over 80 million users, Instagram is one of the most popular social media platforms and knowledgable business owners are privy to this fact. 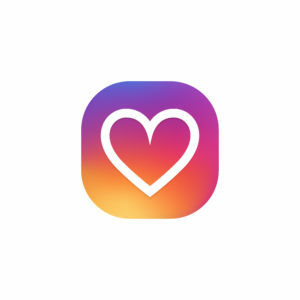 Launched as a photo sharing app for mobile users, Instagram is a place where people post images of their daily lives and businesses post photos of their products. But Instagram’s business opportunities reach so much farther than that. The best business accounts on IG are using the platform to attract followers, show a up-close-and-personal, behind the scenes images, and engage with them in the comments. 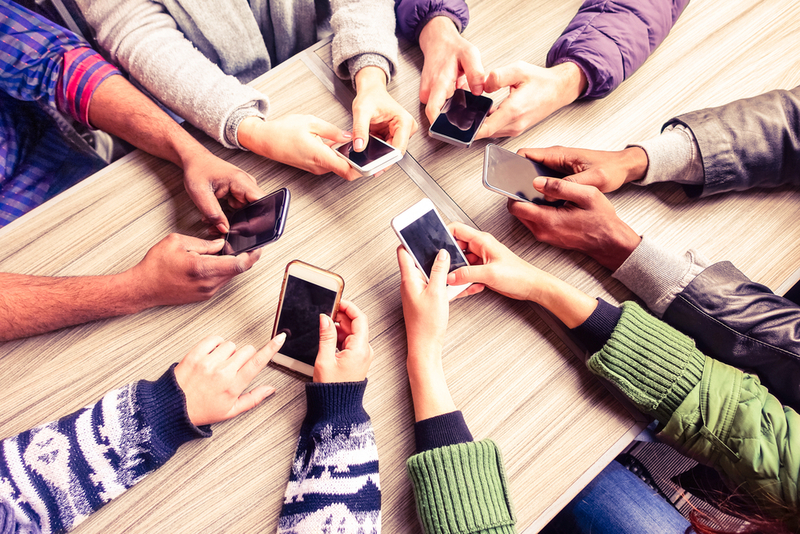 Besides photo-sharing, Instagram also allows users to post video clips up to 60 seconds long and they recently launched a live photo streaming feature. Now owned by Facebook, Instagram is a highly valuable tool and it’s a must-have for your digital marketing strategy. While starting an Instagram and learning to use it couldn’t be any easier, the real trick is knowing the RIGHT way to use it and creating a strategy that will keep you interesting and consistent. There are many, many business accounts on Instagram that are mediocre and ineffective. They have barely any followers, scarcely any engagement, and low quality posts that nobody cares about. Most of these accounts are eventually abandoned. Don’t let your IG business account follow the same fate. Learn how to use Instagram for business and follow the best examples out there so you can use your IG account as a valuable marketing tool! Don’t just wing it on social media. It takes more time and effort but there are rules to follow and methods to practice if you want to be successful. 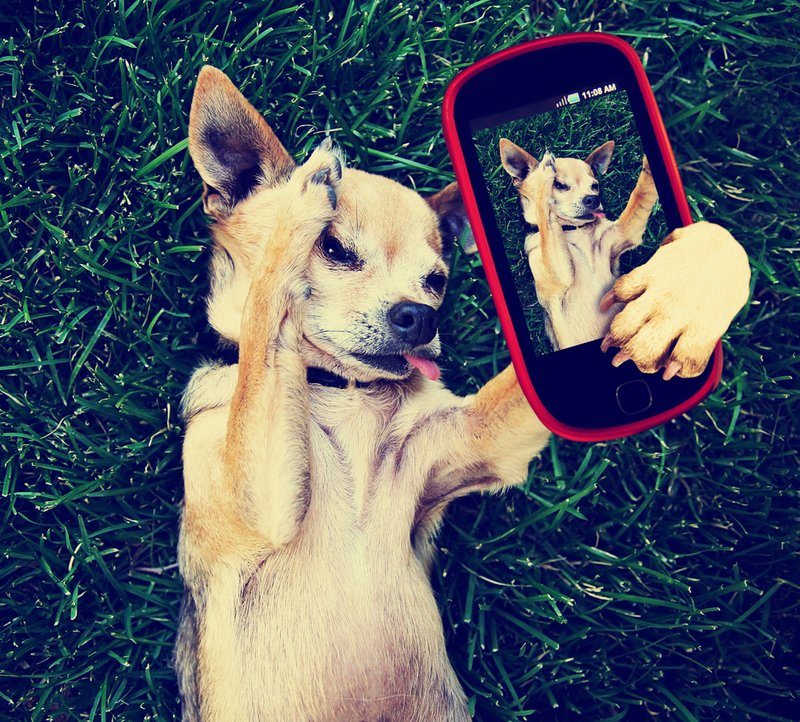 Set smart and attainable goals to guide you on how to use Instagram for business. 1. Style and consistency. 2. Post Engagement and Popularity. 3. Storytelling through Videos. 4. Creative Layout and Design. These things make a big difference when it comes to using Instagram for business! There is a really cool pair of travel bloggers on Instagram who became famous for their style. Murad and Nataly Osmann travel to exotic locations, snapping photos that have a simple but instantly recognizable format. Labeled with the #followmeto hashtag, Nataly stands out in front while holding Murad the photographer’s hand behind her, and she’s seen from behind with an outstretched arm and the beauty of the setting appears in the background. 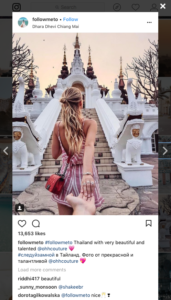 Copycat accounts have emerged since, but this couple has been using this same style for at least five years, taking Instagram by storm and gaining the interest of nearly 5 million followers. National Geographic Traveler featured the couple on their cover with an image captured during a trip to Barcelona back in 2012. Their style and consistency is what helped them to create a brand. The outfits and accessories change every time and the locations and settings change every time, and you can’t even see their faces usually. Still, the #followmeto posts are easy to spot and super cohesive- an excellent lesson for any business owners or brands. 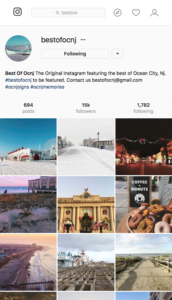 Best of OC NJ is an authority site devoted to promoting Ocean City, New Jersey as a tourist destination, a prime housing market, and it’s used to feature local events and businesses. Most IG posts on this account show great shots of the beach and the boardwalk plus closeups of yummy treats and rides. A hyperlocalized, niche marketing approach is extremely effective on Instagram. Posts like these spread like wildfire when people leave comments and tag their friends. The average post on Best of OC NJ has between 1,000-1,500 organic likes and the videos have around 3,000 views! Many businesses out there are buying likes and followers, but we’ve confirmed that nothing is paid for on this Instagram account. The reason that these posts perform so well is due to the number of authentic, local, highly engaged followers (approx. 8,000 out of 15,000) and because of the hashtags and location tags used. 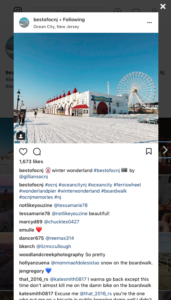 There are 28-30 specific hashtags added to each and every post, plus the Ocean City location is tagged every single time. Be careful when choosing hashtags to avoid the ones on the banned list- otherwise you’ll run the risk of being shadowbanned and kept out of sight without even knowing it. Nike is one of the biggest brands in the world and they obviously have a massive marketing budget and incredible resources. Back when I worked with Nike, I was absolutely floored by the level of excellence and care given to their marketing and advertisement department. 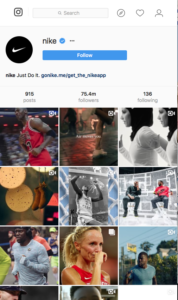 It’s no surprise that of all Instagram accounts looked at for the purpose of this blog post, Nike’s Instagram account was among the most impressive. They utilize the video function even more than just posting photos. In 2013, Instagram rolled out a video feature allowing users to post 15-second clips. Now, Instagram supports videos that are between 3 seconds and 60 seconds long. Nike has welcomed the chance to connect and inspire their followers through the use of this medium. Nike’s Instagram is chock full of beautiful videos that spotlight legendary athletes. Additionally, they post videos that applaud the achievements of everyday people. 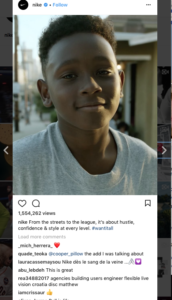 Nike’s videos are no ordinary clips shot with a cell phone as you might expect to see on Instagram. They go above and beyond using professional videographers to capture and edit footage that shows athletes putting their products into action. If you’re going to use video to communicate the message of your brand, this is the way to do it. At DotCom Global Media, we have a heavy focus on design and a sincere dedication to results. For years, our creative agency has worked with social media and experimented with different strategies in-house, but we’ve come to a point where we want to do something new with our Instagram account. Social media success is always measured by interactions and engagement, but we have some cool ideas about how to get there. Instead of starting out with a visibility and engagement mindset, we want to revamp the DotCom Global Media Instagram account to be absolutely design-driven. In 2018, we will be rolling out a unique posting strategy that will tell our story and feature our work in a more creative way. The order of our posts and the design of our imagery will specifically be used to create a distinct layout and tell a full story when viewing our page. We have created a posting strategy for the next several months and are preparing for another photo shoot so we can get the types of images that we want to share. Have you ever heard the disturbing phrase, “There’s more than one way to skin a cat”? Well, this sums up the journey we took regarding Instagram for business use. We have already mastered how use to IG to drive traffic to posts, but now we’re working on making a collection of posts that builds momentum of its own- and it’s going to be epic! Check back next month to see screenshots of our design-driven posts, or follow DotCom Global Media on Instagram so you can watch as we roll out this creative digital marketing strategy. 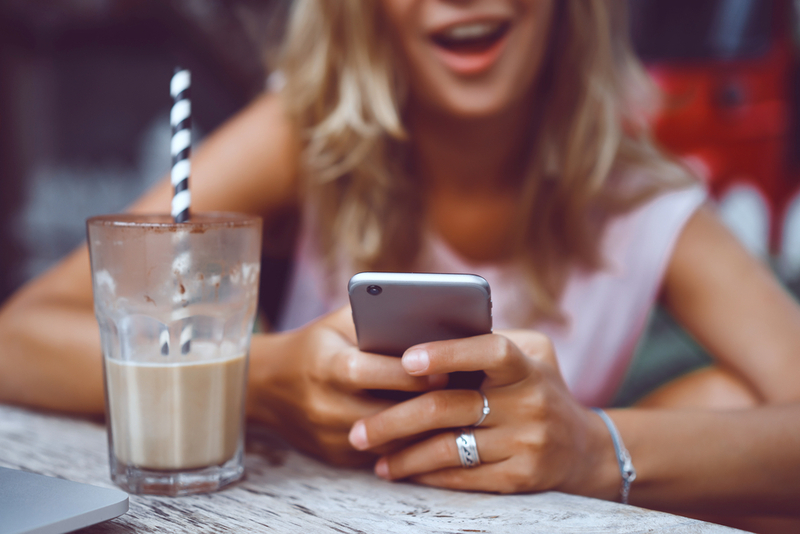 No matter how long you’ve been doing Instagram wrong, it’s not too late to start taking advantage of this social media platform! 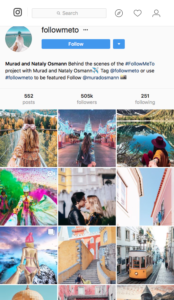 Using creativity and consistency, you can target your ideal customers on IG and build a following of highly engaged people who will advocate for your brand and support your business… and don’t forget about design and messaging! Make it your business to learn how to use Instagram for business, and watch your social media accounts flourish in 2018!